Summer Patterns for "Big Winnie Jumbos"
Eventually the water warms even more and the young of the year Perch become large enough to be the prey for their cannibalistic cousins. During this late summer, warm water period, these small Perch minnows are found scattered all across the lake in open water. From now until fall, Perch can be found in a wider variety of locations, but are still fairly predictable. There will still be some fish holding on the rocks and gravel. But now there will also be large schools of Perch out in the main lake on deep structures like bars and humps. Another key location is found on the secondary drop off. To locate fish along this second drop off, you must first move away from shore crossing the flats that are typically 10 to 12 feet deep and watch for the break line. Unlike the first drop off in the shallows or the deeper main lake break, this secondary break line is subtle and usually drops only a couple of feet as it flattens out again before making the final plunge into the lake’s deeper basin. Perch can be caught along this secondary edge on a lot of days when nothing else seems to be working. You know those August "dog days" that are sunny with flat calm water and blue skies. Try trolling slowly along this secondary drop with a simple live bait rig, using a shorter than normal leader of 2 to 3 feet. Tip the hook with a larger than normal minnow like those big rainbows, small creek Chubb’s or other lively minnow. You’ll be amazed at how large the minnows can be. These larger minnows are a great way to keep the little fish off your line and will really improve the chances of catching some bonus Walleyes or even Northern Pike. If the fish you locate seem aggressive, switch from the rig with a plain hook, to a spinner and pick up the speed. This is one of the few Perch patterns where covering water can be more important than holding still. These fish are often travelling in scattered, small schools and you’ll move in and out of these schools as you move along the drop off. Fishing the deeper breakline can be done in virtually the same fashion. Adjust your weight for the deeper water and fish along the bottom edge of the breaks. At times we’ll find these fish in water depths of 30 to 35 feet, but always check the adjacent shallower flats too. At times you’ll locate fish holding tight to a point or rocks in this deeper water. When that happens, switch to a ¼ or 3/8 oz jig and try fishing vertically again. The open water season comes full circle as fall approaches and the water begins to cool again. Gradually at first, then suddenly the Perch show up in the shallows looking for opportunities to fatten up before winter. Once again, locating shallow rocks and gravel become key and windy days that blow lots of minnows on to these spots will create premium Perch fishing opportunities. Fish become active on the windy days and can be located in 3 to 5 feet of water, right on top of the structures. On calm days, they can be found on deeper gravel stretches, along weed edges and even back out on the deeper breaks. The colder the water gets, the more it’s like fishing for perch in the spring. Fish will begin moving across the shallow flats searching for schools of minnows and we’ll begin to notice more fish mixed with schools of Walleyes on the shallower breaks. Presentations throughout the season are simple. Arm yourself with a handful of jigs, a few live bait rigs and some spinners. Now you’re covered for 95% of the open water season. Even though it’s popular with some folks, I tend to avoid anchoring and bobber fishing because I believe the larger fish in a school, bite quickly and if you spend too much time in one location the average size will begin to get smaller. Moving through schools of fish and circling around structures will attract new fish and you’ll notice that you will catch more of the premium fish by moving slowly. Over the years, we have really grown to love these fish for their scrappy fight, plentiful supply and great eating. Whenever you make the trip to Winnie, take the opportunity to spend some time chasing these great fish and I think you’ll be happy you did. 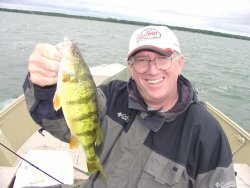 By now, there aren’t a lot of Perch enthusiasts who don’t already know about Big Winnie’s great winter Perch fishing. But for my money, the open water season is the number one time to cash in big on the best Perch fishing Winnie ever has to offer. It’s been proven to me over and over again, that we will consistently have faster action and catch larger Perch during the open water season, than we do in the winter. For everyone who really enjoys catching fish, here are some tips that we’ve discovered over the years, that will help you round out your next summer Walleye trip on Winnie with some fantastic bonus Perch action. Throughout the entire open water season, feeding habits dictate fish location and the foods available to the Perch at any given time, are the key to finding schools of "jumbo" and even "magnum" size Perch. Seasonal shifts in the food supply dictate their location and determine concentrations in key areas. Presentations and bait choices are often simple, inexpensive and require little special training. By following some simple rules of thumb, you can be on these fish all summer long. During the spring/early summer season Perch are roaming the sandy flats feeding on the large schools of minnows in shallow water. The surface temperatures are cool and there aren’t a lot of bait hatches taking place yet. The Perch roam the shallows and are often located near schools of Walleyes that are also following the minnows. Many times we find these fish while we are looking for Walleyes and there’s nothing more to catching them than simply making the decision to stay in the area once you find them. One big difference between Walleye and Perch location in the spring is that Walleyes will often hold tight along a drop off, rock pile or other structure. Perch are more likely to roam the flat areas adjacent to these structures. To concentrate your efforts on the Perch, move your boat slowly in (toward shore) and out (away from shore) on the flats. 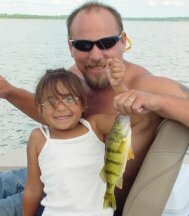 Once you’ve located a school of Perch, slow down and spend more time fishing vertically than trolling. They react well to hopping and dropping your jig and Perch don't have much fear of the boat so they will actually gather under the boat for a short period of time. Once the school begins to break up, continue to move across the flats until you encounter another school. At this time of year the Perch will often move with the baitfish and it’s a good idea that we keep moving too. As the water warms and we begin seeing insect hatches and Walleyes moving into deeper water, I start watching for my favorite Perch pattern of the year, the first Crawfish hatches. Perch love these little critters and will show up in big numbers to feed on them. Crawfish begin to hatch first on the shallow gravel and rock stretches located near shore and as the water continues to warm up, will eventually hatch on the deeper rock bars out in the main lake. Once these rocky areas are full of these small ½ to 1-inch size Crawfish, the Perch will begin to gather. These small Crawfish will attract and hold schools of fish for days at a time and since these hatches don’t all occur all over the lake at the same time, this pattern can be good for a month or more. This is action-fishing time and fishing aggressively with a bug-eyed shorty or bottom walking type of jig, tipped with a minnow or small piece of night crawler will get you lots of bites. Hop and pop the jig to get their attention and try switching to a slower vertical approach every few minutes to catch fish that have gathered under the boat. It’s a good idea to locate several rock/gravel stretches and check them all. Many times I’ll check 8 to 10 of these structures before I locate the one that’s holding fish. Once you find them, it’s Action City! Upper Right: Gabriela Goettl shows off a great Perch she caught during the "dog days" of summer. This is the perfect experience for kids who thrive on action and at the end of the day, there's a fantastic fish fry in store for the whole family! Below: Arne Danielson demonstrates the true meaning or the term Jumbo Perch. We call these "magnums" and it's hard to beat 'em for action and table fare.